Are you peaceful? Are you also a warrior? Apparantly the two words can sit together despite seeming contradictory. Dan Millman is a former world champion gymnast, coach, martial arts teacher and college professor, and he is author of 17 books published in 29 languages and shared across generations to millions of readers. His classic work, Way of the Peaceful Warrior, was adapted to film in 2006. its been a bestseller for over 36 years, sold more than 3 million copies. Dan speaks worldwide to people from all walks of life. I was lucky enough to interview Dan for Hay House Radio and was struck by his down to earth approach and ‘easy to implement’suggestions He is passionate about helping people move towards accelerating change, transcending the daily news, feeling less anxious and re-aligning through the ever constant present. Dan believes we are all peaceful warriors – striving to live with a peaceful heart. He believes we should look to peace, but we also need a warriors spirit to live as our wisest selves. Dan’s book isn’t a memoir, he rather uniquely blends fiction and autobiography. Dan’s new book The Hidden School reveals a book within a book, a quest within a quest and a bridge between worlds. Dan Millman takes readers on an epic spiritual quest across the world as he searches for the link between everyday life and transcendent possibility. 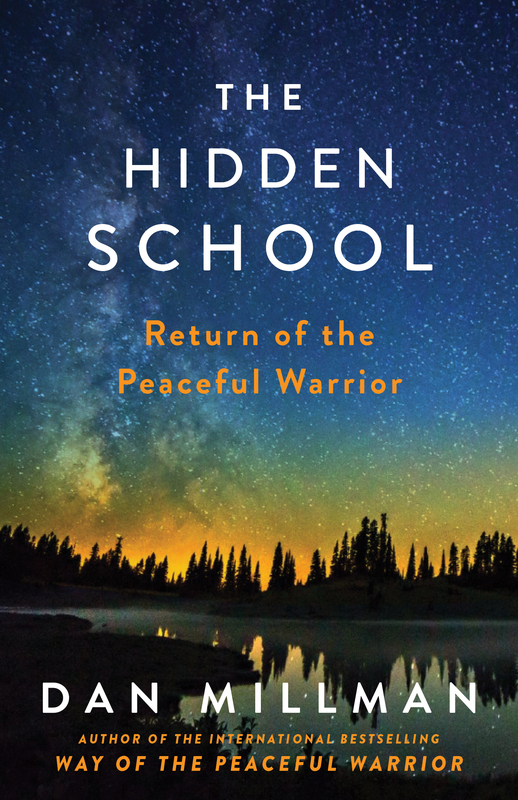 Continuing his journey from Way of the Peaceful Warrior, Dan moves from Honolulu to the Mojave Desert, and from a bustling Asian city to a secluded forest, until he uncovers the mystery of The Hidden School. While traversing continents, he uncovers lessons of life hidden in plain sight – insights pointing the way to an inspired life in the eternal present. Along the way, you encounter remarkable characters and brushes with mortality as you explore the nature of reality, the self, death and finally, a secret as ancient as the roots of this world. Awaken to the hidden powers of paradox, humour and change. You may discover a vision that may forever change your perspectives about life’s promise and potential. Dan is very realistic, he makes a rather controversial statement saying that he doesn’t believe we should be grateful, courageous, happy… he believes that we should just ‘behave’ that way, he points out that its not possible to determine if we have courage unless we have to face fear, it’s not so much about ‘trying’ to be grateful et al, it’s just getting on with it. I shared with him my fave phrase ‘You don’t have to get it right, you DO have to get it going‘ and he loved that. With The Hidden School you can go on a spiritual quest, along with Dan, and look at how we can live our most rewarding enriching life. https://janeyleegrace.com/images/Hidden-School-cover.jpg 2550 1650 Simon Etchell https://www.janeyleegrace.com/images/small-banner.jpg Simon Etchell2017-05-25 21:51:262017-05-25 21:51:26Are you a peaceful warrior? Organic Beauty & Wellbeing Week 15th – 21st May 2017 – Are... What Are You Thinking?